You can buy this print at Artprints by Creative Digital. Using lens filters eg. polarising, neutral density, graduating etc, is quite a new addition to my arsenal of photographic styles. Up till now, the only filter I had in use was a UV filter, and that was simply to protect my lens from getting scratched. Lately, I have noticed a number of photographers using an ND (or neutral density) filter when shooting oceanscapes. ND filters are extremely popular for rivers and waterfalls, but used to a lessor extent for coastal shots. So I thought I would give it a go. I purchased a 10 stop ND filter (ND1000) from a private seller on Trademe. I did not want to spend a lot given this was my first attempt, so was happy with the $50 price tag. The brand is K & F Concept, which several bloggers have identified as a good low budget solution. 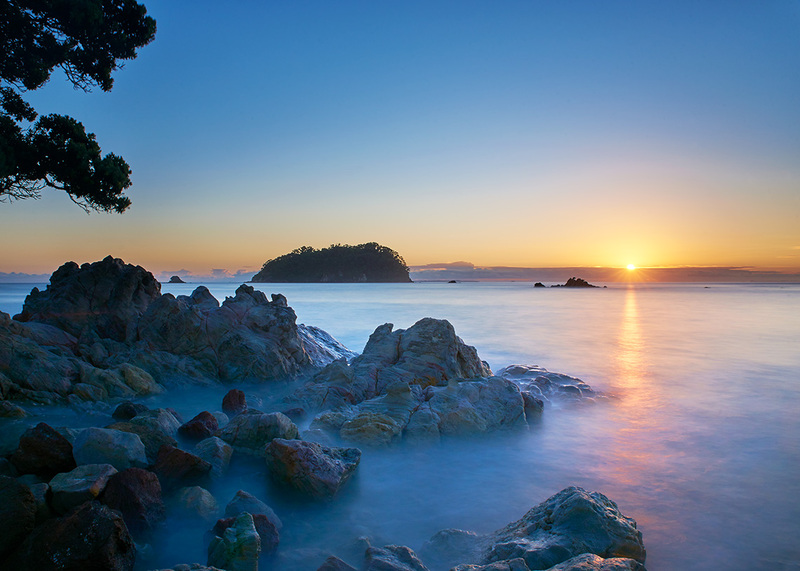 As I was staying at Mount Maunganui at the time, I had excellent access to a stunning coastline. Unfortunately, the swells were tiny, generating no significant surf for the entire time I was there. I did not let this get in the way of some experimenting however, and spent several enjoyable mornings shooting the sunrise. This particular shot – available on our Artprints by Creative Digital website – was my favourite of the lot. I love the milky reflection of the sun and the almost mist like effect the filter has created around the foreground rocks. I used the following settings: 24mm / ISO 100 / F22 at 30 seconds. The only downside I have identified so far with this filter is extreme vignetting at wide angles eg. 24mm. I am not sure if this is visible on all types of ND filters, but I was able to fix easily with a quick crop and dodge in Photoshop (feel free to comment below if you have any ideas).